Wow Cat driving a car?! Have you ever wondered what car your cat would buy if it had a driver’s license? I will give you a moment to think… Did you picture your pet wearing sunglasses casually driving an Aston Martin through the city and winking at feline beauties at every traffic light? Did you imagine your cat revving the powerful engine at the sight of the enemy and then engaging in a spectacular car chase through the narrow streets of the city centre? Basically, you think your cat is the next James Bond, right? We totally agree. Cats are perfect secret agent material. They’re fearless, highly intelligent, perceptive, flexible and sneaky if they need to be. Their above average levels of patience make them the best hunters in the world and would make even the longest stakeout a piece of cake. As for the choice of a vehicle, we’re not so sure your cat would choose a supercar. Think about it. Supercars are loud and flashy which would attract a lot of unwanted attention. They’re a nightmare to park in the city centre and cost a fortune to insure! They’re also worthless during a car chase as they would get stuck on the first speed bump on the way… Your cat is smarter than that! Our feline spy needs something small, inconspicuous and nimble; he needs the Smart Cardboard Cat House. 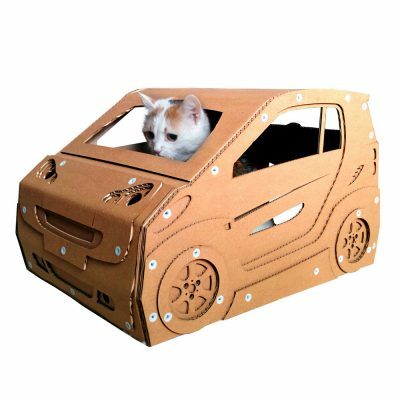 This cat house shaped like a Smart is perfect for those top secret missions when 007 has to blend in. It has plenty of boot space for all the (cat) spy toys and its compact size makes it ideal for moving around the city (i.e. in-between your sofa and the armchair) as well as following suspects (i.e. spiders or flies) into the town’s tiniest crevices (i.e. behind the fridge… again…). Our Smart Cardboard House is more than cat furniture; it’s a spy gadget, an indispensible accessory for our heroic agent. It will bear silent witness to great feats of courage, movie-like action sequences and possibly some history-changing events. Not bad for a cat bed, eh? 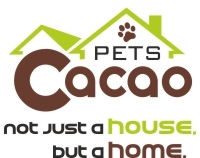 Your pet will love this 21st century equivalent to a man cave… or should I say ‘cat cave’ where it can indulge in its passions, invite all its buddies and have a great time!